Zurich (Apr. 10, 2019) – The catastrophe loss experience of the last two years is a wake-up call for the insurance industry, highlighting a trend of growing devastation wreaked by so-called “secondary” perils (independent small to mid-sized events, or secondary effects of a primary peril). Insured losses from natural catastrophes in 2018 were USD 76 billion, the fourth highest one-year total, according to the latest sigma report from the Swiss Re Institute, and more than 60% of the losses resulted from secondary perils. The insured losses from natural catastrophes in 2017 and 2018 together were USD 219 billion, the highest ever for a two-year period. In 2017, when aggregate natural disaster insurance claims were the highest ever in a single year, more than half were due to secondary perils. Losses from secondary perils are rising due to urbanisation, rising concentration of assets in areas exposed to extreme weather conditions, and climate change. Total global economic losses from natural catastrophes and man-made disasters in 2018 were USD 165 billion. Tragically, 13 500 people lost their lives or went missing in catastrophe events last year. The insurance industry covered USD 85 billion of global economic losses, the fourth highest one-year aggregate industry pay-out ever, and above the previous 10-year annual average of USD 71 billion. Of last year’s insured losses, USD 76 billion were due to natural catastrophes, also the fourth highest on record. Industry practice has been to consider secondary perils as two types of event: (1) independent, high-frequency (ie, more frequent than primary peril events such as earthquakes and hurricanes), low-to-medium severity loss events (relative to losses resulting from primary perils); and (2) events that occur as secondary effects of primary perils (eg, a tsunami following an earthquake). Table 1 provides more detail of secondary vis-à-vis primary perils. The single largest insurance loss-event of 2018 was Camp Fire in California (USD 12 billion). Other significant secondary peril events last year included a hail storm in Sydney in December, and the secondary-effect flooding across the Carolinas in the US in the aftermath of Hurricane Florence in September. Losses from secondary perils have been rising due to rapid development in areas exposed to severe weather and warmer temperatures, and we expect this trend to continue. While the probability outlook for more extreme primary catastrophes like hurricanes due to climate change remains uncertain, more extreme weather conditions and more frequent occurrence of resulting secondary perils is already reality in many places across the world. “Secondary peril-losses will accelerate due to ongoing urbanisation, also in areas exposed to flooding such as along coast lines and in river plains, development in areas vulnerable to fire risk like wildland-urban interface, and also because of long-term climate change projections,” Edouard Schmid says. Indicative of a growing trend, the combined insurance losses for 2017 and 2018 were USD 219 billion, the highest-ever for a two-year period, with more than half due to secondary perils (see Figure 2). There were no mega-loss generating events in 2018. Of last year’s losses, 62% were due to secondary perils. 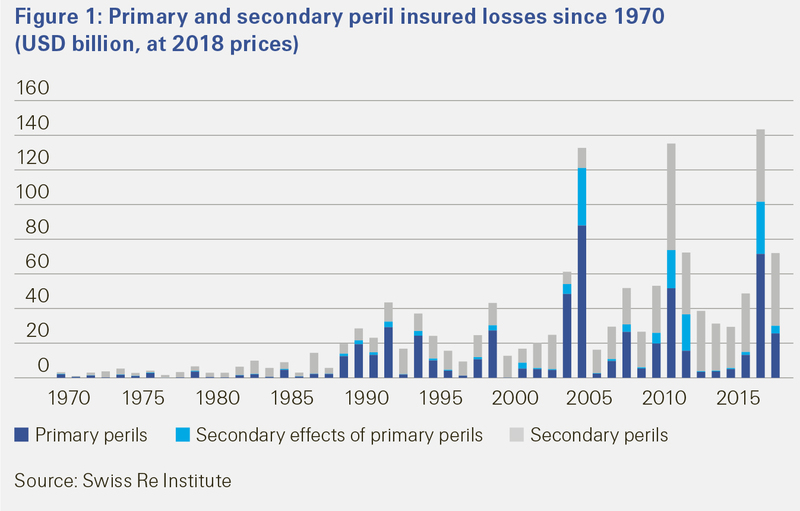 The potential force of secondary perils is further supported by the peak loss experience of 2017, when Hurricanes Harvey, Irma and Maria took the insured loss total for the year to the highest ever. Even with these mega-loss events, more than half of the annual losses were due to (less well-monitored) secondary perils. The combined global natural catastrophe protection gap of 2017 and 2018 was USD 280 billion, and more than half of that resulted from secondary perils. Explanations for underinsurance include lack of consumer risk awareness, a poor understanding of the catastrophe cover available, and hesitation on the side of the industry to provide cover where risk assessment is uncertain. Assessing secondary peril risks can be difficult given their unique features. For example, secondary perils are often highly localised, but with variables that are in a continual state of flux given land-use changes and greater occurrence of extreme weather. Re/insurers can also build socio-economic resilience through their investment activities, in particular by being able to invest more in sustainable infrastructure projects. There are many examples of disaster mitigating defenses having been strengthened as part of reconstruction efforts after a catastrophic event. With a more conducive investment and regulatory environment, insurers can play a much more effective ex-ante role. According to Swiss Re Institute estimates, global re/insurance assets amount to approximately USD 30 trillion. Even a small part of this could unlock a significant amount of capital for deployment into long-term resilience-building infrastructure projects. The sigma No. 2/2019 report, “Natural catastrophes and man-made disasters in 2018: Secondary perils on the front line,” is available electronically on the Swiss Re Institute website. The Swiss Re Group is one of the world’s leading providers of reinsurance, insurance and other forms of insurance-based risk transfer, working to make the world more resilient. It anticipates and manages risk – from natural catastrophes to climate change, from ageing populations to cyber crime. The aim of the Swiss Re Group is to enable society to thrive and progress, creating new opportunities and solutions for its clients. Headquartered in Zurich, Switzerland, where it was founded in 1863, the Swiss Re Group operates through a network of around 80 offices globally. It is organised into three Business Units, each with a distinct strategy and set of objectives contributing to the Group’s overall mission. For more information, please visit www.swissre.com.